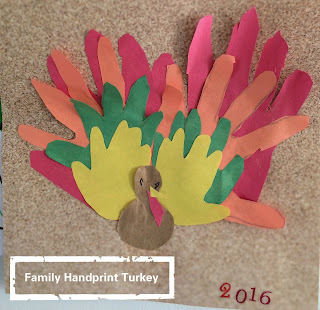 It is a easy fun craft for toddlers. Just some basic constraction paper. We used brown bag for color brown. The first day, she cut the hand-prints. My elder daughter is three. She just likes cutting activity. The next day, she cut the brown turkey body, then glued everything on the big piece of scrapbook paper and drew the turkey eyes. The final day, the glue was dry. She picked the numbers from two sticker sheets and mark her artwork "2016" on the right bottom corner. We hang it up on her art display wall together. If your kids are still too little to do the cutting, still trace their cute little hands and do the easy work by yourself. It takes five minutes. This is the one we did when we were a family of three.